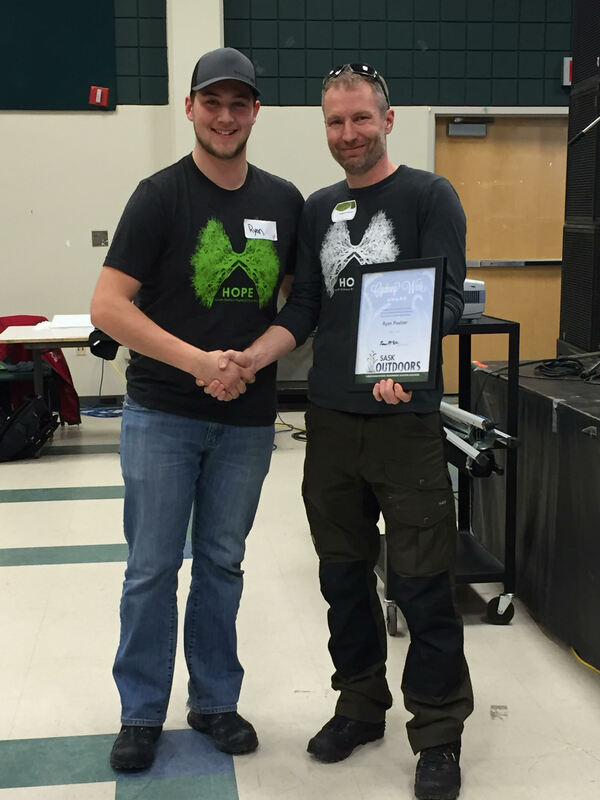 Congratulations to Ryan Poelzer, the 2016 receipient of the Cydney Weir Award for Youth Environmental Leadership. I would like to nominate Ryan Poelzer for the Cydney Weir Award. Ryan is 20 years old and is currently enrolled in the faculty of Education at the University of Regina. I have known Ryan for nearly 7 years and in that time his passion for the outdoors and his level of caring for our planet and for natural places has amazed me. I was first made aware of Ryan during a visit with Colin Frey when Colin told me, “I have a great guy for your Outdoor School (ODS) program.” Colin met Ryan at a Paddle Canada canoe session and Ryan made an instant impression. Ryan applied for and was accepted into ODS and were we ever lucky to have him. Ryan was amazing! Ryan is smart, energetic and caring. Ryan worked hard throughout the semester and was always there to help his instructors and his fellow students. When he told me that he was going to apply to get into the College of Education and that he was going to take over my job someday I couldn’t have been more thrilled. Ryan is and will continue to be a leader in outdoor education. Ryan has worked as the Canoe Program Director, Outdoor Education Director and has led multi night canoeing and hiking trips for camp Monahan during his nearly 10 years of involvement with the camp. Ryan also volunteers with Caring Hearts Camp, a weekend kids retreat for kids that have lost a loved one. Ryan is a member of the U of R HOPE association and one part of his role with the organization is to work with the Growing Young Movers program whose aim is to get inner city kids active and comfortable in the outdoors through involvement with after school programs. Ryan has been a leader in Outdoor Education since I have known him and in spite of his young age, he has accomplished a lot! In my 7 year of running the Greenall Outdoor School program I can not think of a more worthy recipient of this very meaningful award. Thank you very much for considering this application. Ryan was presented the award at the Health, Outdoor and Physical Education Professional Development day at the University of Regina in March 2016.